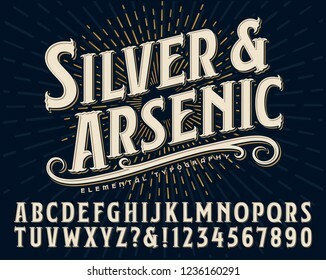 536 place | Vector illustration in rank M-rank: Silver and Arsenic font is an old style display alphabet. This vintage lettering style would work well for handcrafted artisanal logos or branding designs. Silver and Arsenic font is an old style display alphabet. This vintage lettering style would work well for handcrafted artisanal logos or branding designs.